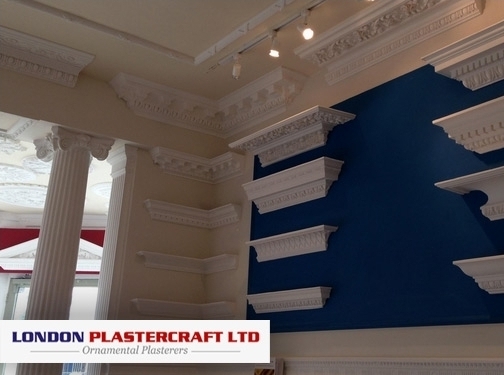 Formed in 1990 by directors Mark McKeever and Bill Thompson London Plastercraft Ltd are a plastering company in London with a team of experts in both interior and exterior moulded works. We produce only the highest quality of work and strive to ensure every job that we carry out is to the highest standard. We offer a huge number of products to choose from covering every coving and plaster product required for your home. Our products cover many different time periods, styles and sizes so no matter what your requirements are you are bound to find a product suited to your needs. Our cornices cover the Victorian, Georgian and Edwardian eras as well as many other styles including modern and art deco. Our cornices are well sort after which is why they have become a popular choice amongst our customers. Should you require a ceiling rose, column or fire surrounding then our plaster products cover many styles that will have you lost for choice. Please visit our website and browse through the many products we have available! UK (Fulham, London) based business - established in 1990 - providing plaster products and exterior / interior moulding services. Website includes catalogue of products, details of services provided (including work examples), associations, full contact details. Company website has been online since 2001 according to web.archive.org.